Expert blog posts about all things bartending. 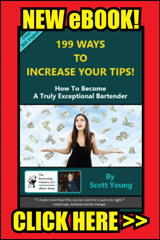 Guest posts, expert bartender posts and posts from our founder Scott Young all about useful tips and tricks as well as on how to become a better bartender. Let us be a part of your bartending journey. I just saw this but wanted to shine some light on it. A restaurant in Honolulu, Keoni by Keo’s, has printed this policy on their menu. The menu also says parties of six or more will be charged the same amount. The Waikiki restaurant told a reporter at KITV that, "its customer base includes many international travelers who, by custom, do not tip. The restaurant says it's merely trying to help its customers and wait staff." The restaurant also said, "IRS rules require the restaurant to consider 8 percent of its total sales as tips, so waiters must pay taxes, even on tips they often do not receive." The policy is printed in red on the customer's check and is explained when the customer pays at the register. The restaurant said if the customer does not want to pay the gratuity, then they simply don’t. Have you seen this happen anywhere? There’s been a lot of confusion about this subject but I’ve got info from an expert to break it down. PJ Calihan is the business development & hospitality associate at HRI. HRI specializes in providing human resource, employment and safety solutions to meet the needs of restaurants and hospitality businesses. They help protect their clients’ businesses by effectively reducing their liability risks that are inherent in hospitality operations. Wow! I never imagined my last blog post regarding the IRS taxing auto gratuities would get so much attention. The discussions in the comments were colorful to say the least and a lot of arguments were made. It is quite clear that there are some problems in the industry regarding how hospitality staff are compensated. Many individuals argued due to the low minimum wage many states can legally pay servers (as low as $2) that they need the tips to survive. I agree that many of you count on those tips and if you don't receive them, you go without. However, the nature of a tip and its history has always been about an optional variable amount based on the service given. The history of tipping should not be ignored here. As some have stated, the responsibility lies on the employer to compensate their staff fairly and it is unfair to take this frustration out on the customer. Fair point. What is frustrating when it comes to customers? When you give great service and get little to no tip... This can really affect you and may be the reason some people have placed the blame on the customer. Many customers don't think a tip is deserved, no matter how good the service is. Someone posted, "A tip is not mandatory, however if decent or better service is given, I should receive a proper tip. It is defeating when I put a lot of effort in and that exceptional service is not appreciated." That is a fair and reasonable statement. That is a statement I think it would be hard for others to argue. So in the end, do I think a tip should be mandatory? No I do not, but if fair or better service is given then yes, some level of compensation definitely should be strongly considered and hopefully, the customer will recognize the extra effort and/or excellence of the server and reward them for it. Want to increase your odds of getting tipped? 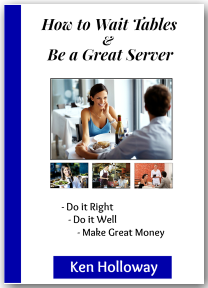 Find ways to become an exceptional server. To Tip or Not To Tip? This choice should be totally left up to the individual customer. Don't agree with me? Let's hear your thoughts... What do you think a tip for "fair" service should be? Now it's Taxed Like Regular Wages. ... it's taxed like regular wages. Attention: All Servers, bartenders, waiters/waitresses, owners and bar & restaurant accountants. Did you know? 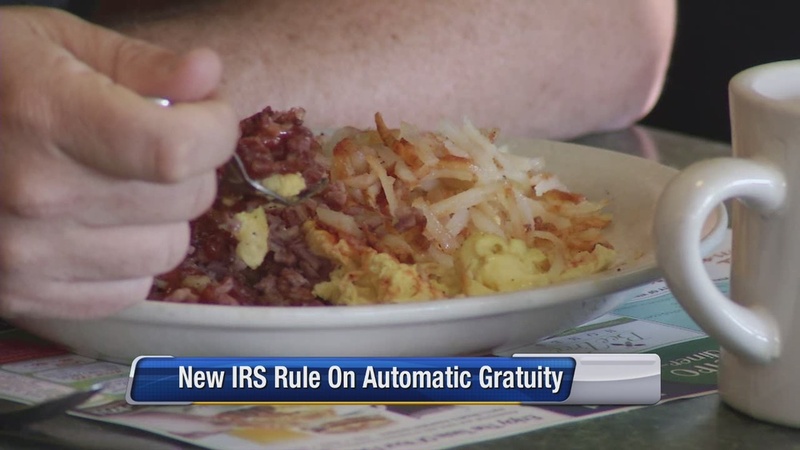 As of January 1, 2014 the IRS will classify automatic gratuities as taxable service charges, just like regular wages, and are subject to payroll tax withholding. Update: follow-up post to this post and you can read it here. It’s a huge new years resolution for the IRS affecting tens of thousands of people in the service industry. "WHY LIMIT YOURSELF TO 1 PRODUCT OR TRAINER? In the past, many places, usually restaurants, would automatically add a tip or gratuity to a bill with 6-8 people or more. Usually the gratuity added would be from 15% - 18%. Well, experience tells us that the bigger the group is on one tab or check…. - Some people just forget to pay etc. etc. The IRS used to leave it up to the employee that was tipped to declare the money. Starting on Jan 1, the establishment has to withhold those tips until payday so the waiter or bartender won’t get those tips that shift. That’s not all. Restaurants have to withhold Medicare taxes, Social Security and federal income also. Just to be accurate, this isn’t exactly new “news”. The IRS rolled out this rule June of 2012 but decided they needed to give the service industry enough time to make changes & comply properly. What do you think about the change? Good or bad for servers? Good or bad for employers? Good or bad for customers? How is it going to effect you and your co-workers? Do You Have Any Stories? Update: I have written a follow-up post to this post and you can read it here. The Bartending Masters - Learn How to Become an Exceptional Bartender and Earn More Money with Tips from the Masters. An Online Resource for Bartending Training eBooks, Guides and More.